Walkers Crisps have launched a brand new promotion, with a huge number of prizes that, unlike last year’s awful Spell and Go, should all be awarded! There’s 40 pairs of Champions League tickets (including accommodation and travel allowance), 500 PlayStations and 7000 footballs to be won, awarded in daily prize draws until 23 April 2017. Look out for ‘Snap & Share’ on the sharing bags and grab bags of Walkers (which might not be available everywhere – check larger supermarkets, and end-of aisle displays). UPDATE 21st February: There are two Tesco-specific promotions that have launched too – see the end of the post for details! Share your photo on Instagram or Twitter using #WalkersUnited – or share as a comment on their Facebook post. You can enter three times every day before midnight – daily winners will be chosen at random from all entries across Instagram, Facebook and Twitter and contacted within 3 working days via a message on that platform. 6 pairs of Champions League Final tickets including travel & 2 nights’ accommodation. 14 pairs of Semi-Final Match tickets including travel contribution & 1 night accommodation. 20 pairs of Quarter-Final Match tickets including travel contribution & 1 night accommodation. Note that if you enter on different platforms, you may well receive 2 – or even 3 – separate winning messages for a football – but as it’s only one of each prize allowed, you might want to respond to one message and ask them to pass the football to a reserve winner. The promotion is open to UK, ROI, Channel Islands & Isle of Man residents only. With around 90 prizes to be won every single day, there’s a great chance of winning in this promotion. 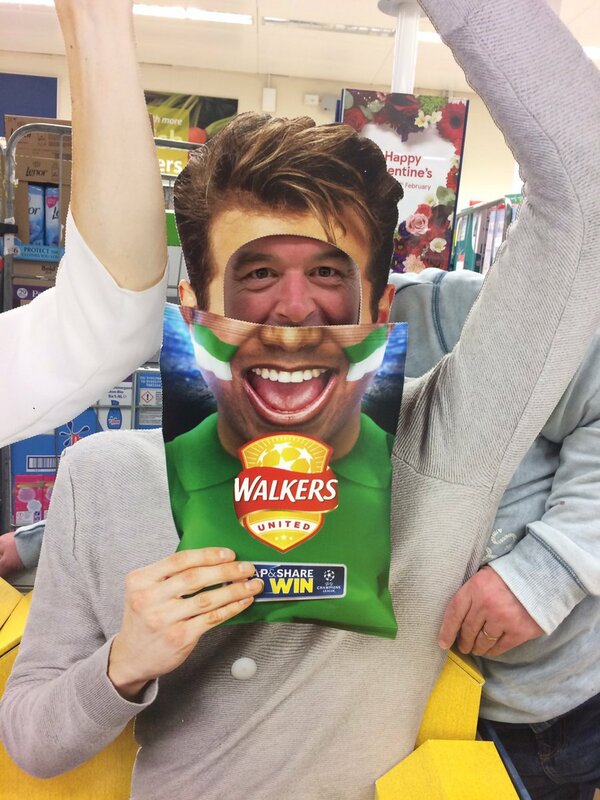 If you spot a Walkers Snap and Share selfie stand (there are two types – one with a silhouette card insert, and one that has people with cutout faces) in your local Tesco and take your photo with it, you can add the #Tesco hashtag to your #WalkersUnited entry and also be entered into a bonus Tesco daily draw in addition to the regular daily draw. Prizes of 250 PS4s, 150 Sony headphones and 340 footballs will be won over the course of this additional Tesco promotion (this ends on 14th March 2017). But be careful – you can only enter three photos each day, NOT three for each draw. Adding #Tesco and #WalkersUnited to your three photos ensures you’ll be entered in both daily draws, but make sure your photo is taken in Tesco! Again – submit on the same pinned Facebook post on Instagram or Twitter. Confusing hey? T&Cs are combined with the main promo ones here. In addition, the Walkers sofa will be touring Tesco stores until 12th March – have your photo taken on it and complete an entry form in store for a chance to win one of four prizes worth £10,000 (including UCL Final tickets, PS4, TV, Soundbar and even a DFS sofa!). Check out the list of participating stores and dates (it’s there between 12 & 2pm on each day) at www.walkerssupersofastores.com – but you might want to call the store before travelling, as I’ve heard some visits have been cancelled! There are four separate random prize draws to decide the winners. T&Cs are here. Whew! Let me know in the comments when you get lucky! I won with this promotion from Tescos. Thank you Di! Won a football and got some Bluetooth headphones today, happy with that. As many are, still hoping for that PS4. I see quite a few more creative entries and also some of the more creative ones winning which has people speculating that it’s not random after all. Thoughts? Thanks Di. I figured that was the case, thanks for your take on it. Just heard quite a bit of chat about the number of more quirky ones winner. Hi Di, thought I would pass on my thanks to you. I have won a Playstation 4 via Facebook which should have been a football but somehow ended up turning into a PS4 and have also won a football on Instagram. This was my very first competition entry on Instagram as I’m new to this and still trying to get my head around Instagram. I have also been lucky with the instant win soup and mug competitions and have won with both Asda and Tesco, I’m guessing they are separate competitions. I wasn’t even that bothered about winning a mug and a tin of soup, I think I was determined just to win, I think that’s what comping does to you! First day of entering, only just found promotional packet. Still, at least I’ve got one before the competition ends. Thanks for the guide di (Di’s Prize Guides?!) – you have made a pretty complicated comp clear and I’ve won headphones and a football so far! I have won a Football on Twitter , only my second everTwitter win so really pleased. I will keep tying for PS4. Twitter. I’m doing all entries on Twitter now, I don’t want to risk turning down a duplicate PS4 if I’m also entering on Instagram or Facebook! Thanks for sharing Di, so far I’ve won a football but I’m going to stick at it and try and win the PS4. I had to turn down a football too – but I heard some people had to turn down a second PS4, which is when I decided to do all three daily entries on Twitter instead, so I wouldn’t have to turn down a duplicate PS4 or even UCL tickets (that would be awful!) I’ve not entered once on Instagram because it looks so spammy, and I find Twitter quicker to do than Facebook so if I were you, I would just send 3 tweets every day. I’ve won a football in the main promotion, and a football/PS4/headphones in the Tesco one – all from Twitter entries. Be patient and I’m sure you’ll get your PS4! What time does the daily competition run between ie 00:01 to 23:59 or some other time? Each ‘day’ ends at midnight Tom. Good luck! I am really pleased I have won a football and Semi Final tickets ! I have entered via twitter using same photo 3 times a day. Great stuff – well done Jojo! Is there a minimum age you need to be I can’t seem to see anything about that? Thank you I don’t know how I missed it! My husband isn’t a comper but I persuaded him to do this one. On Thursday he won a Football from his Facebook entries, on Friday he got a message informing him he is one of the Champions league ticket winners from his entries on Twitter. Needless to say he is well chuffed and I am hoping he’ll take a bit more interest in comping now! Thanks Di, won a PS4 this week, to go with the football I won a while ago. Yahoo I won a football, thanks Di. The T&Cs says that accounts should be set to public so that they can contact you. Do they mean “public” for twitter. My facebook page is locked to “friends” but am I right to think that since I commented on their page Walkers could message me? Is there somewhere special I should be looking for messages? Thanks team. The Facebook entry is on the Walkers page (the direct link is http://bit.ly/SnapSharePost) so your post will be public if you leave it as a comment there. Under your comment is a MESSAGE button for them to contact winners directly, and that should go into your regular message inbox! Thanks Di, you are a star! Thank you for sharing Di. I’ve won today, just a football but I’m happy with that! My first instagram win too 🙂 Thanks again! The first of many I hope! Congrats! Congratulations Andrea – you can never have too many footballs ha ha! Same here! Good luck! I’ve had four PS4 winners AND a ticket winner contact me today. Whoop!